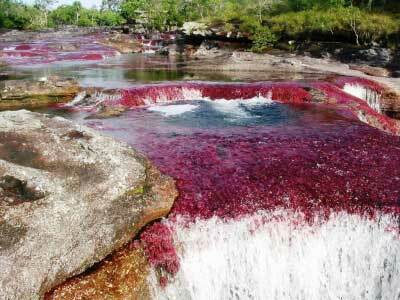 The river shown in the photographs below is the Cano Cristales, which is located near the town of La Macarena in Colombia, South America. 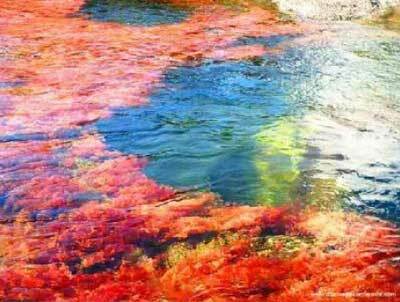 The river, world famous for its colorful display. 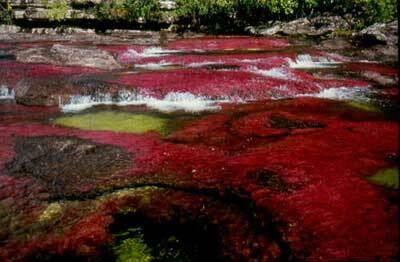 The bed of river in the end of July through November is variously colored yellow, green, blue, black, and especially red, the last caused by the Macarenia clavigera (Podostemaceae) on the bottom of the river. 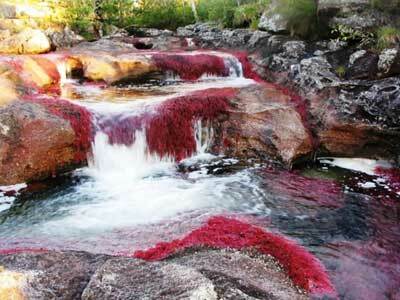 “the river of five colors”. During Colombia’s wet season, the water flows fast and deep, obscuring the bottom of the river and denying the mosses and algae that call the river home the sun that they need. During the dry season there is not enough water to support the dazzling array of life in the river. But during a brief span between the wet and dry seasons, when the water level is just right, the many varieties of algae and moss bloom in a dazzling display of colours. Blotches of amarillo , blue, green, black and red – and a thousand shades in between – coat the river. The part of the river where the colourful blooms occur is quite isolated and is not accessible by road. Adventurous tourists can now fly into La Macarena and then make their way to to the river site on foot as part of guided tours. The site was effectively closed to tourists for several years because of guerrilla activity in the region along with concerns about the impact of unregulated tourist traffic. However, the site was re-opened to visitors in 2009. 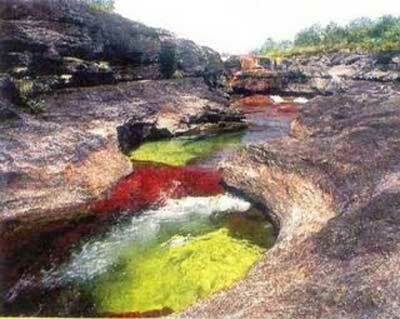 Cano Cristales is a fast river with many rapids and waterfalls. Often in the bed have formed small circular pits – giant’s kettles, which have been formed by pebbles or chunks of harder rocks. When one of these harder rock fragments falls into one of the cavities, it is rotated by the water current and begins to carve at the cavity wall and increases the dimensions of the pit. 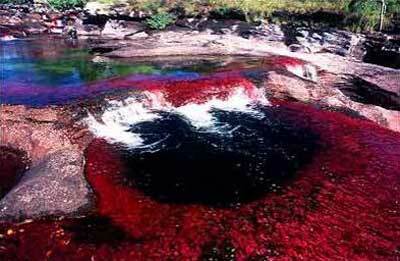 Cano Cristales river has aquatic plants but is devoid of the fish. The water of the river is extremely clean due to the lack of nutrients and small particles. 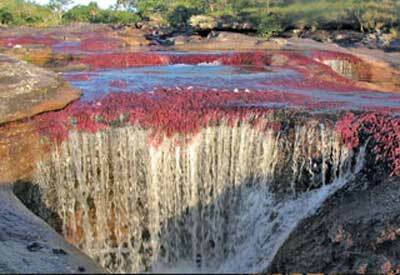 Almost unique is the bright red – pink coloration of riverbed after the rainy period in the end of July – November. This color is caused by great quantities of endemic plant species Macarenia clavigera. This plant is found in some more local rivers, such as the Cano Siete Machos. 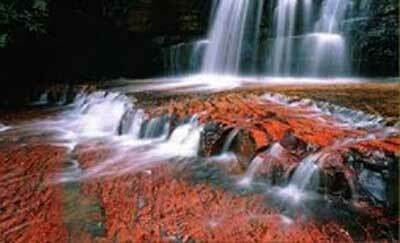 These red plants adhere tightly to rocks in places where the river has faster current. 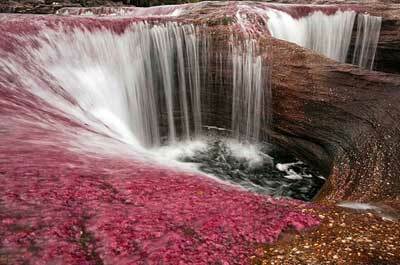 To reach Cano Cristales, it is necessary to travel to the municipality of La Macarena, Meta, in Meta Department. There are two ways to get there, from Villavicencio, in a DC-3 cargo aircraft coming out every day, or from Bogota, by direct flight that departs every Friday and returns on Sunday. 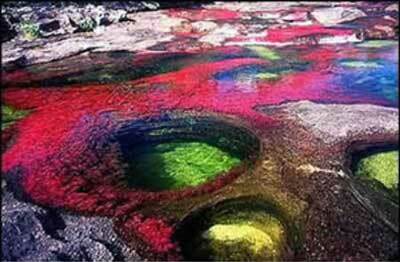 There are no campsites available near Cano Cristales. 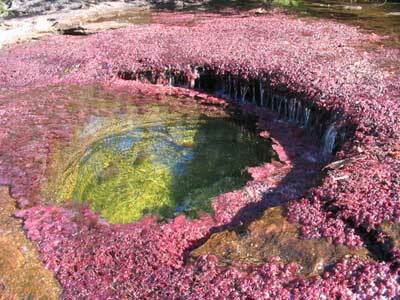 A popular time to visit Cano Cristales is from late July to early December.